"Remembering Real Radio - a walk through the radios of the 30s through the 60s." 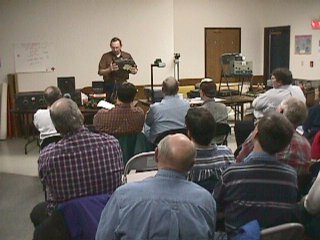 Mel, KCØP, and Niel, WØVLZ, gave a presentation on the history and evolution of ham radio equipment at the January club meeting. 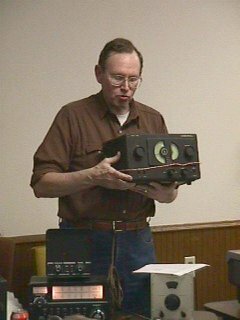 The presentation was well attended and everyone enjoyed seeing the vintage radio equipment. Club members listen as Mel. KCØP, describes some of the radio gear on display. 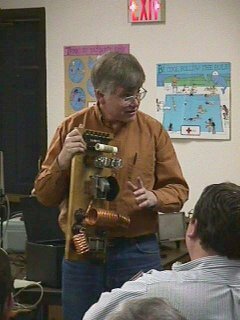 Niel, WØVLZ, demonstrating a 1930 home brew transmitter design that puts out 2 watts! Mel KCØP shows off a 1950s Hallicrafters S38B receiver. 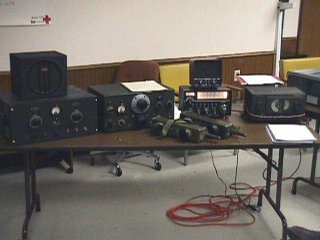 Some of the vintage transmitters and receivers that were discussed during the presentation. Some actually worked!